December 14, 2018 (Los Angeles, CA) - House of Fine Art is pleased to present All I Ever Wanted Was Everything, an upcoming solo exhibition of new painting and sculpture works by Amsterdam-based artist Joseph Klibansky. The solo exhibition, which marks Klibansky’s first in Los Angeles, will open at HOFA Gallery (819 N La Cienega Blvd, Los Angeles, CA 90069) on February 1 and remain on view through March 2, 2019. Using iconographic and pop culture vernacular, Klibansky's paintings reference the bleak and melancholic through a seemingly utopian lens. Playing with the implication of what is seen versus what an image implies, Klibansky’s hyper-realized paintings and sculptures address phenomenology (the study of structures of consciousness as experienced from the first-person point of view) and explores realms where both utopian and dystopian truths can co-exist. Continuing the artist's ongoing exploration of perception, Klibanksy’s large-scale idealistic paintings feature a process of figurative and abstract layering. Through this process, the artist is able to compress time, space and narrative and examine the relationship between what we see and what an image can imply. Implication and paradox are at the heart of Joseph Klibansky's work. What can first appear joyous can descend into bleak melancholy. Using a visual vocabulary sourced from photographs and online material, Klibansky intercuts images, including iconic cartoons, and creates digital compositions which serve as the foundation for the series. He layers the photographs, enriched with acrylic paint, on archival cotton paper and overlays it all with a liquid resin. 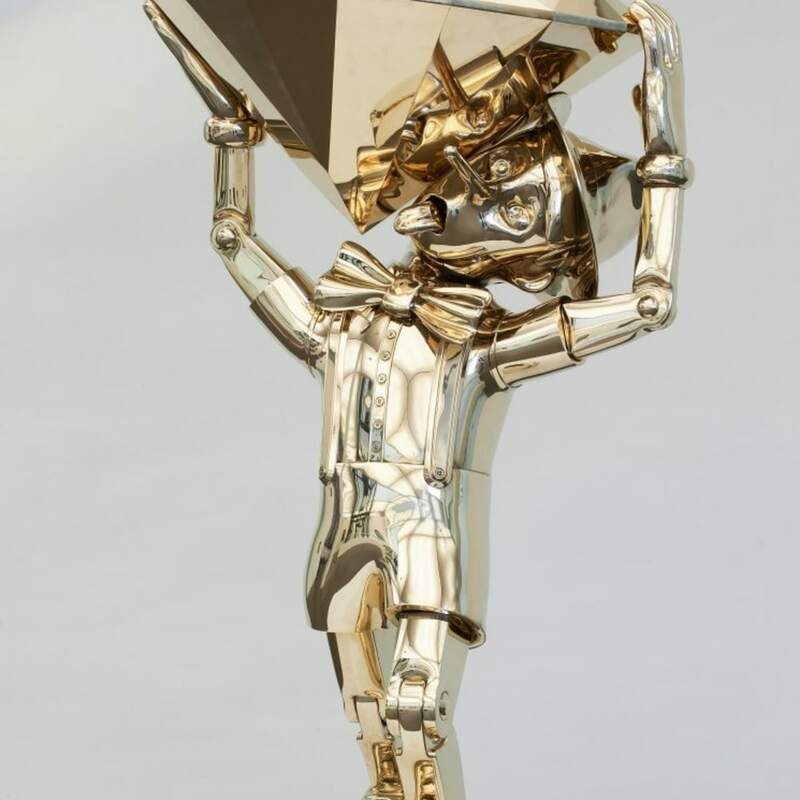 Alongside the paintings, HOFA will be exhibiting select pieces from Klibansky’s series of bronze sculptures. These playful figures aim to represent the juxtaposition between symbol and association. In Reflections of Truth II, Pinocchio and his long nose stand, weighted down by an impossibly-large diamond carried on his shoulders. Made of shiny, polished bronze, the deceitful puppet can be found almost charming. Big Bang , a gigantic black gorilla head clad with a golden party hat and horn, is shown in sharp contrast with the animal’s sullen gaze. Made of glossed and polished bronze, this sculpture was realized with the aid of a 3D printer. Klibansky’s practice often allows technology and traditional artistic techniques to coexist. Renowned art critic Peter Frank furthers, “Joseph Klibansky is making conceptual sculpture, not Pop sculpture per se, so he operates in a discourse closer to Hirst than to Koons, but directly related to neither. I see clearly what he is saying as an individual artist, and how he is saying it, and how he evolved to this point." About Joseph Klibansky: Joseph Klibansky (b. 1984 in Cape Town) is an emerging artist based in the Netherlands. Klibansky’s work examines the relationship between a thing and its essence, between what we see and what an image implies. He has exhibited at prestigious locations around the world including: Palazzo Cavalli-Franchetti (Venice), National Museum de Fundatie of Zwolle (Netherlands), and The BVDS Gallery (Venice) in conjunction with the 57th Venice Art Biennale.